We are in the middle of a 20,000 mile adventure that started in the beginning of May from Sedona AZ, north to Alaska, down to the west coast of British Columbia and across Canada to Nova Scotia and Newfoundland before we hopefully return to Sedona in Oct. While in Alaska, we had an electrical issue that caused our 2017 Sprinter to stall one day (in Anchorage where we had lived for 35 years before retiring, now we spend our winters in AZ). Long story short, TrailerCraft (the Sprinter dealer and warranty repair facility for all of Alaska) wound up changing out the CAN module and the ignition module). Everything was fine but after a month on the road again and 5000 more miles, our van would not start after only a 10 minute stop in Ontario. It acted like the battery was dead even though it fired up fine that morning and we traveled about 30 miles before stopping and the incident occurred. We had someone jump start us and even though it started fine, the "ding, ding, ding" sound (like when the door is opened with the keys still in the ignition and the engine is off) started and would not stop even with the keys completely removed from the ignition! We drove about 15 miles to the nearest town (a very little town with limited services) with the sound dinging the whole time. We stopped and decided to try to turn the ignition off and see if it would start again and thankfully it did. I looked in the manual and tried pulling some fuses to no avail to stop that damn dinging sound. Eventually after a few minutes after we stopped, the door open dinging stopped on its own. But I have a check engine light on and I'm thinking I have another computer module problem. So we are sitting in an A&W parking lot using their free WiFi to find a dealer and figure out what's going on while fretting about where, when and how long this will take to deal with and hopefully solve our problem. Turns out that the nearest dealer is 6 hrs away was at least 2 weeks out just to look at it! On top of it all it was Friday at 530pm and everything was closed or closing for the weekend. We’re on the internet and calling all over Ontario, Minnesota, Wisconsin and Michigan but most dealers were already closed and the ones we did find open were a week or longer out before they could even look at our rig. We eventually found a MB dealer in downtown Chicago who could get us in first thing Monday morning even though they were 800 miles away from us but we made the appt. We decide we are going to head towards Chicago and go to fire up the van again and nothing but a bunch of idiot dash lights and the van is dead again. If I don’t get this thing fired up again, Monday morning in Chicago is out and we are going to have to get towed to the nearest dealer and wait 2 weeks to be seen. At this point, I’m not happy to say the least. We flag a guy down and ask for a jump. He tries but the most we get is barely a partial engagement of the starter once in awhile but nothing more. We try letting it charge, we tried getting a booster, nothing happens most of the time and once in awhile we get the partial turn on the starter. We also have a newer and bigger diesel pickup truck with dual batteries try to jump us and nothing. Now the van is basically doing nothing once I turn it to the full ignition position except idiot lights. Although the headlights are still bright if I turn them on. I am convinced I have a computer module problem even though we were thinking a starter issue was plausible. At this point I now have 8 guys, 3 pickup trucks, and a car standing around scratching our collective heads and it starts to pour rain with thunder and lightning! Can this get any better? Finally, we decide to try connecting directly to the battery rather than the jumper posts under the hood. I remove the floor covering and the battery cover. When I open the battery compartment and remove the red plastic cover that goes over the positive terminal and the fuse block that hangs to the side, I notice that the cover is partially melted where it sits over the positive terminal and that the brass/copper tab that connects the fuse block to the positive terminal has scorch marks indicating that the connection was arcing. I wire brushed the terminal and tightened the nut holding the fuse block to the terminal and the van fired right up! The check engine light even went out on its own without me clearing any codes. Now, normally I would have checked the battery and its connections except for 2 things. My first mistake: after already having a computer module problem, I had it in my mind that this was another similar issue. My second mistake: I thought that since the van is relatively new and the battery is located inside the vehicle in a sealed compartment and not exposed to the elements, it is less likely to corrode or be loose (we only picked our van up 5 months ago in March from SMB Austin). Lessons learned: There are about 4 heavy duty cables (2.0?) that go into the fuse block that hangs off the side of the battery. This fuse block with the heavy cables attached are connected to the positive terminal with a single relatively small nut. Over time (and many miles bumping along rough Alaska and Yukon roads) this terminal block can loosen this nut causing arcing and all kinds of weird issues like appearing that the battery is dead and door open bells dinging even when the key is removed from the ignition. Lesson #2. Two long driving days after the whole fiasco was resolved we find a place to camp late that night and look at our battery monitor and it shows 12.2vt after driving nearly 500 miles that day. It’s late and I’m road weary but I figure and hope it is a fuse issue. So again, I take the floor covering off along with the battery cover and replace the 150 amp fuse on the infamous fuse block next to the battery (indicated in our SMB owners manual) and thankfully it takes care of the issue. I ran the high idle for 30 minutes and we were good to go for the night. Thanks to Tim “Fitz” I bought a couple of these fuses before we left on our trip and had them on hand as we were out in the middle of nowhere in Quebec camping down a forest service road. 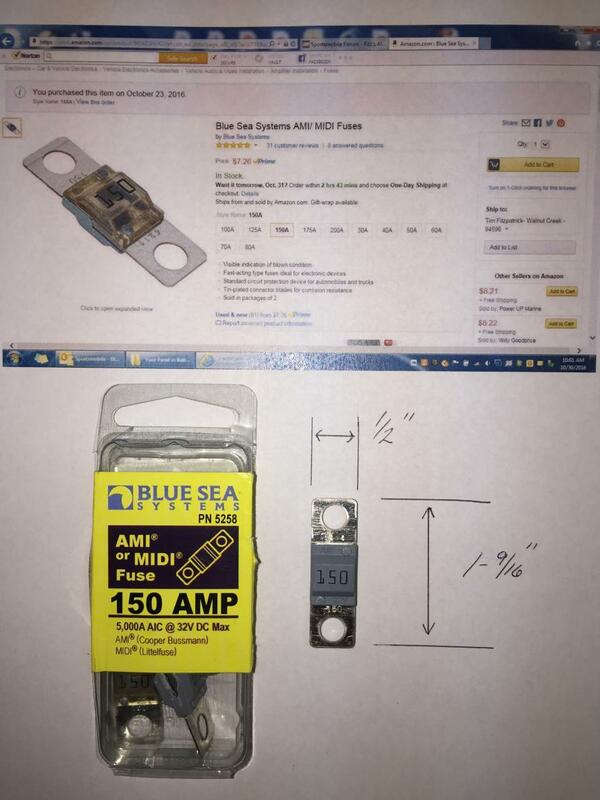 You have no way of knowing if these fuses are blown or not as there is no indication if they do blow. You just have to swap them out to confirm whether or not they were the issue. Thankfully it was a relatively easy fix. We are now in Nova Scotia and have traveled 1900 miles since the incident last Friday. We have fired the rig up and shut it off many times each day to make sure the issue is resolved. The van has started each and every time and there are no new codes other than the ones from the incident that day mostly referring to low voltage and such (sorry, I’m in a hotel room for the night and do not have the code info here with me). I know this is a long winded post but I just wanted to give as much info as possible so that someone else might avoid allot of headache and heartache and possibly avoid a tow. I would recommend that you all check your battery connections to confirm that they are secure. I am now wondering if my original module problems in Alaska were not related to this issue as initially TrailerCraft could not find anything wrong with the van at all. It was only after my insistence and contacting MB USA for further help that they decided to change out the modules. I plan to eventually post a trip report of our adventure but probably not until we return. We are traveling with limited cell service and no data plan since we will be in Canada for about a total of 6-8 weeks and Verizon charges too much in my opinion for decent data coverage ($5 per day X 60 days?). We just grab WiFi where we can. This is good info for any Sprinter owner I'm sure----thanks for sharing your story and the fix too! Not long winded, all good info. Keep passing on the learnings, that’s what makes this such a great place. I have been wondering where you were on your epic journey, now we all know! Thank you for sharing your well written story. Battery connections are so critical, especially these days with so many electronics. Something about that battery cover picture is not adding up for me. The melt pattern looks like something else created it. Was it possibly modified for clearance? Re: checking fuses - an ohm meter will tell right away if a fuse is good or bad. On the other hand, if it is a resting circuit breaker type, it may be weak under load but still show continuity at rest. Glad you are back rolling. Your description of “Checking” multitimes a day is so accurate! Confidence in our rigs is so important. When it is shaken, twice! it takes a bit to get it back! Yours is the third Sprinter horror story I heard this summer in the North Country. En route to Alaska this summer I met a guy in the Dawson Creek Walmart lot in June who had an issue with his Sprinter and had to backtrack to a Sprinter dealer somewhere many hours away, losing three days off his trip. He also told us of another owner of a nearly new 4x4 Sprinter that was at the dealer for many days waiting for a new transmission to be shipped from Germany to fix his shot one. I love the way Sprinters look and drive, but I'd sure think 3x before buying one due to the sparse dealer network. Had read through your earlier build thread, and glad to hear you have been enjoying your toy (also that you managed to identified your issue - peace of mind). I've been told that at this stage in my life (anything over 50) "I have more memories now than i will experiences going forward"... at the rate you're going this doesnt seem like it applies to you! You've got great campfire stories now. [QUOTE=akfiredude;233421]Lesson #2. Two long driving days after the whole fiasco was resolved we find a place to camp late that night and look at our battery monitor and it shows 12.2vt after driving nearly 500 miles that day. It’s late and I’m road weary but I figure and hope it is a fuse issue. So again, I take the floor covering off along with the battery cover and replace the 150 amp fuse on the infamous fuse block next to the battery (indicated in our SMB owners manual) and thankfully it takes care of the issue. I ran the high idle for 30 minutes and we were good to go for the night. Thanks to Tim “Fitz” I bought a couple of these fuses before we left on our trip and had them on hand as we were out in the middle of nowhere in Quebec camping down a forest service road. You have no way of knowing if these fuses are blown or not as there is no indication if they do blow. You just have to swap them out to confirm whether or not they were the issue. Thankfully it was a relatively easy fix. Wow! Not too long winded at all. Thanks for giving us informative details.It is posts like this that help the rest of us to be a whole lot better prepared. Interested in the results of the autopsy. Was there ever a consensus or definitive conclusion why the VOM tests good when the fuse has actually failed? I use one of these ANR fuses for my JL Audio power amp mounted onto the passenger seat base in an appropriate fuse block and cover. Taped close by is one more in case something happens to the first. Fortunately still running on the original fuse installed some 6 years ago.